On a Saturday afternoon in early May, Gertrude Marshall stood on a sidewalk in front of Flint City Hall holding a hand-printed sign that declared, “We Need Affordable Water.” A 48-year-old grandmother with a kind face and determined eyes, she had come alone to protest the city’s skyrocketing water rates. In the month of April, the city had issued shutoff notices to 378 customers who could not afford to pay their bills. 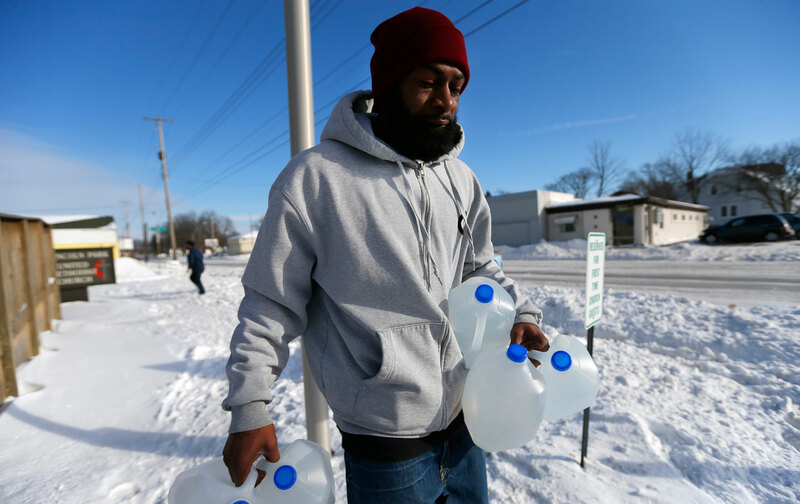 In some respects, Flint’s water affordability crisis is difficult to fathom. Michigan is “The Great Lake State” after all, a place surrounded by 20 percent of the world’s fresh surface water, suggesting that water should be extremely affordable. But as in Detroit, its more famous sibling city to the south, water has become a high-priced commodity that too many residents can no longer afford. With average household charges nearing $150 a month, Flint’s water and sewer rates are among the highest in the United States. Nor is price the only water problem facing the people of Flint. Since the city’s emergency manager switched the city’s drinking-water source in April 2014 from Detroit’s system to the Flint River—a move that was billed as a cost-saving windfall—residents have endured a series of water-safety scares. First came the three boil-water warnings, which the city issued after finding evidence E. coli and other nasty bacteria in the city’s water supply. These were followed by nine months of dangerously high levels of total trihalomethanes, a carcinogenic byproduct of chlorine, which put the city in violation of the Safe Drinking Water Act; the city had ramped up the chlorine in an effort to kill the E. coli and other gut-busting microbes. Along the way, people have complained about rashes, hair loss, bad smells and worse, leading a group of them to file a lawsuit on June 5 to force the city to stop getting its water from the Flint River. More recently, an internal Environmental Protection Agency memo obtained by the ACLU of Michigan raised concerns about the possibility of widespread lead contamination after the water in one family’s home was found to be contaminated with lead at a level of 13,200 parts per billion (ppb). A lead level of 5,000 ppb is classified as hazardous waste. The EPA memo asserted that the lead issue was the direct result of the cash-strapped city’s inability to handle the job of water treatment. Much of Flint’s water woes—both in terms of quality and cost—can be tracked to its crumbling infrastructure: 600 miles of poorly maintained pipes plagued by hundreds of water main breaks a year. The whole system is in desperate need of repair, but the city, which is just now exiting receivership, isn’t in any shape to foot the bill—and no one else is stepping in to help. Flint is a city with little more than half the residents it had when its population peaked in 1950. Likewise, only a fraction of the manufacturing jobs it previously had remain. Once a successful auto town—and a hub of organized labor—it counted only 8,000 General Motors jobs in 2006, down from nearly 80,000 good-paying union jobs in 1978. And jobs weren’t the only things the auto plants took when they closed; the tax revenues that flowed from them dried up as well. As a result, an ever smaller and poorer number of people have had to shoulder the costs of maintaining a decrepit water and sewer system. For wealthier Flint residents, the relentless rise in rates has been irksome. But for the increasing number of poor people—the city’s poverty rate has swelled to more than 40 percent—the rate spikes are devastating. So is the unsafe water. “People are forced to decide what bills are going to get paid,” said Flint resident Melissa Mays, a mother of three who’s struggling to make ends meet when the monthly water bill is over $300. Marshall, a childcare worker and grandmother who lives in a house with one other person, said in May that her last monthly water bill was more than $200. “A lot of people just can’t afford bills like that,” she said. Outside the borders of Michigan, the story of Flint has gotten little attention. But the country ignores the plight of women like Mays and Marshall at its own risk, because their struggle is a growing one, spreading quickly past the frayed borders of Flint toward other troubled cities throughout the United States. Just 70 miles to the south, Detroit’s spiking water rates have led to shutoffs so massive and unremitting that the United Nations condemned the disconnections as a violation of human rights. This past April, Baltimore also made headlines when reports surfaced that officials there were preparing to start the process of cutting service to some 25,000 homes—a threat that has so far resulted in 3,000 customers’ losing their water. And the number of Baltimoreans who can’t afford to turn on the tap is destined to grow as the city’s water and sewer rates are slated to increase a combined 42 percent over a three-year period; the money has been earmarked for infrastructure replacement that’s both costly and badly needed. As in Detroit, water has become a high-priced commodity that too many Flint residents can no longer afford. Much of the problem can be attributed to a change in policy on the part of the federal government, which reduced funding for water and wastewater systems by 80 percent between 1977 and 2014. As a result of those cuts, consumers have been forced to bear most of the burden of paying for the repair and replacement of aging water infrastructure, causing rates to soar. One particularly stunning survey of 100 municipalities by USA Today in 2012 found that water prices had doubled in more than a quarter of the cities since 2000, and even tripled in several others. And they’re going to continue to climb. With the federal government filling in only a fraction of the gaps, municipal systems’ solution of choice has been to dump rising infrastructure costs on customers by raising prices. But cities have also been exploring other options, including privatizing their water systems (which James Kelly explores in his article about New Jersey’s recent water privatization push) and switching over to cheaper water sources, as Flint has done. Rarely, however, have the changes offered much benefit; frequently, they have made the situation worse. This shouldn’t have to be Americans’ fate. Once upon a time, this country dreamed of big and ambitious interventions to help its residents live safe, secure, and comfortable lives—a notion that stakeholders like the US Conference of Mayors have echoed, however faintly, in asking Congress to provide direct financial relief to municipal water systems. As of now, the federal government merely makes money available to revolving loan funds that must be repaid—with money coming out of the pockets of consumers. Once upon a time, this country dreamed of ambitious interventions to help its residents live safe, secure lives. But getting Congress to come up with the cash is a decidedly tough task in an era when lawmakers eschew any form of tax hike, focusing instead on attempts to rein in the federal budget by hacking away at established programs. So, as we wait and dream for more visionary days, we can and should begin pushing for another solution that makes both economic and humanitarian sense: government can step in and begin helping customers with their exorbitant bills, the same way it provides a safety net for other fundamental needs, such as food, housing, and heating bills. Making that argument all the more compelling is the fact that in parts of the country water rates “are rising faster than any other utility rate, including heating bills,” the National Consumer Law Center reported last year. Why should water be treated differently? The idea, which is beginning to make the rounds in cities like Detroit, is for income-based affordability plans based on a customer’s ability to pay. That means, essentially, that poor people are provided a discount based on their income levels. Although it might seem counterintuitive, such an approach actually results in water utilities collecting more money than if the rates were higher. When bills are out of reach, people tend to toss them aside rather than make partial payments. If, on the other hand, they take a reasonable portion of a person’s income—the US EPA suggests no more than 4.5 percent for water and sewer—then people are not just able but also willing to cough up the cash needed to keep the water flowing. In June, the Philadelphia City Council voted unanimously to set rates for impoverished customers based on their incomes. And the City of Brotherly Love will be better off financially for it. Curt GuyetteCurt Guyette is an investigative reporter for the ACLU of Michigan, which has been heavily involved in trying to fight water shut-offs in Detroit.